Great Barrier is the largest island in the Hauraki Gulf of New Zealand, about a hundred kilometres to the east of Auckland on the North Island. 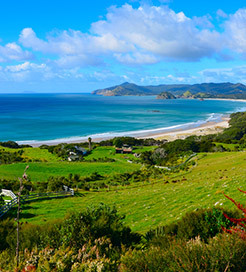 Showcasing some of New Zealand’s most untamed and beautiful wilderness, Great Barrier Island is the sixth largest in the country. The eastern coastline has long protected Auckland from the raging Pacific Ocean, with high cliffs and world class surf breaks, while on the other side you’ll find idyllic bays and sheltered beaches. More than two thirds of the two hundred and eighty five square-kilometre island is owned by the Department of Conservation, encompassing hot springs, waterfalls, a forest sanctuary and natural swimming holes, so it’s best enjoyed by foot. One of the best hiking routes takes you up Mount Hobson, reaching six hundred and twenty seven metres high, rewarding you with panoramic views and a great chance to spot some of the endemic bird species like black petrel and North Island kaka parrots. A more family-friendly track can be found along the outskirts of the Kaitoke Swamp, past an ancient conifer forest, to the sulphurous hot springs. But if a simple stroll is what you’re after, be sure to explore the fabulous Aotea Conservation Park, covering twelve thousand hectares and home to the richest and most diverse plant life in the Auckland area, including numerous rare frogs. Tryphena, the main settlement, stretches several kilometres along the southwest coast, making it a great hub for marine excursions like dolphin-watching, fishing trips, kayaking and diving. Port Fitzroy, with its humble population of thirty, is a must-visit in January while the annual Mussel Fest is held, celebrating the exquisite mussels farmed there. For keen athletes, the ‘wharf to wharf’ marathon held each October is ideal for getting closer to Great Barrier’s wildlife and natural scenery, nicknamed ‘New Zealand’s friendliest marathon’. As one of the most popular weekend break destinations in the Auckland region, sailing to Great Barrier Island from the capital is quick and easy. Sealink NZ offers year-round trips to the island half a dozen times a week, lasting roughly four and a half hours each way. For more information, please visit our Ferries from New Zealand to Great Barrier Island page.